Having a swimming pool is an awesome amenity to your home, providing relaxation and adventures to its users. According to the National Association of Realtors statistics, a swimming pool can even increase the value of your home by an average of 7.7%, adding a greater level of attraction to those thinking of buying your home. A swimming pool is certainly an added asset to a home. Whether you’re considering building a pool or you already have a swimming pool, you’ll probably avoid swimming in it if the water is too cold. Without some sort of heating, your pool water won’t get as warm as you’d like, so to enjoy your pool on more than just the hottest days of the summer, it’s best to consider pool heating options. In each of these heating methods, there are a few pool heating options as well. For example, in the umbrella of solar pool heating, there’s solar energy, solar water heaters, solar panels, solar collectors, etc. Each method provides several benefits, but there’s one pool heating solution that proves to be efficient, resilient and intuitive—a heat pump pool heater. Homeowners looking to extend their pool seasons, while staying cost-efficient and environmentally conscious, are turning to heat pump pool heaters to solve their heating needs. 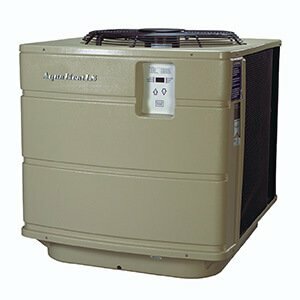 What exactly is a heat pump pool heater, and how does it work? A heat pump pool heater is an advanced-technology pool-heating solution that maintains efficiency even after years of use. Essentially, the only cost is the compressor and fan motor operation, allowing you to then consume the “free heat” from the air! A fan pulls warm air over the evaporator coil causing the liquid refrigerant inside to heat up and turn into a gas. The warm refrigerant gas enters a compressor which increases the temperature and pressure of the gas. The hot-gas refrigerant exits the compressor and enters the condenser heat exchanger where the heat is transferred to the pool water flowing on the other side. Having lost some heat to the water, the hot gas reverts to a liquid state before exiting the condenser and entering a thermal expansion valve. The thermal expansion valve allows the refrigerant to expand, decreasing its temperature and pressure before starting the cycle again. In simpler terms, heat pump pool heaters transfer heat from the ambient air to the pool water and run on electricity, functioning similarly to a home air conditioner. Sizing a pool heater is less tricky than sizing a pool heat pump or gas heater. Pool heaters are sized using BTUs, which stands for British thermal unit. A BTU is the measured amount of heat created by a pool heater. Outputs range from 75,000 BTU to 450,000 BTU. To calculate an approximate heater size for an outdoor swimming pool, follow these steps. When it comes to efficiency, you’ll want to compare the cost of performance (COP) of the pump you’re considering. The higher the COP, the more energy efficient it is. Typically, COP is measured by testing a heat pump pool heater with an outdoor temperature of 80 degrees. COPs usually range from 3.0 to 7.0, which converts to an efficiency of around 500%. This means that for every unit of electricity it takes to run a compressor, you get 3-7 units of heat. You’ll also want to ensure the pump you choose is installed and sized by a professional. At AquaComfort, our 25 years of continued innovation in energy-efficient technology, combined with our network of professional dealers, make your choice for a reliable heat pump an easy one. 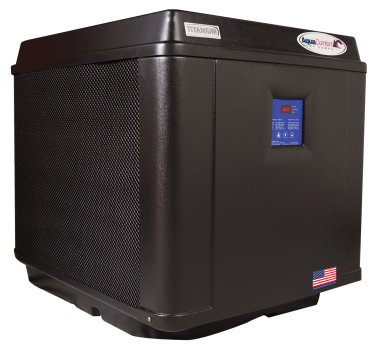 Heat-pump pool heaters can be up to 80% cheaper than propane gas heaters, and up to 70% cheaper than natural-gas heaters. Don’t believe us? With just a few details about your pool size and location, you can find out just how much money you can save on your pool specifically using our Savings & Sizing Calculator. In addition to cost, there’s a long list of benefits that are worth noting when choosing AquaComfort as your heating solution. 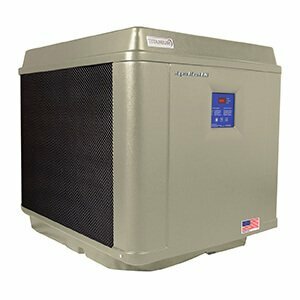 Over 100,000 pool owners across America efficiently heat their pool with AquaComfort pool heat pumps. Whether you live in Florida, California or even up north, AquaComfort can deliver warmer water temperatures with no emissions and a significantly less operating cost than all other pool heating products. Not only are you saving money, you’re helping save the environment! 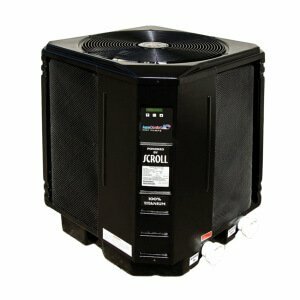 We also offer reliable and trustworthy service and support for our product owners. When problems do occur, we’re ready to help find solutions and make things right. 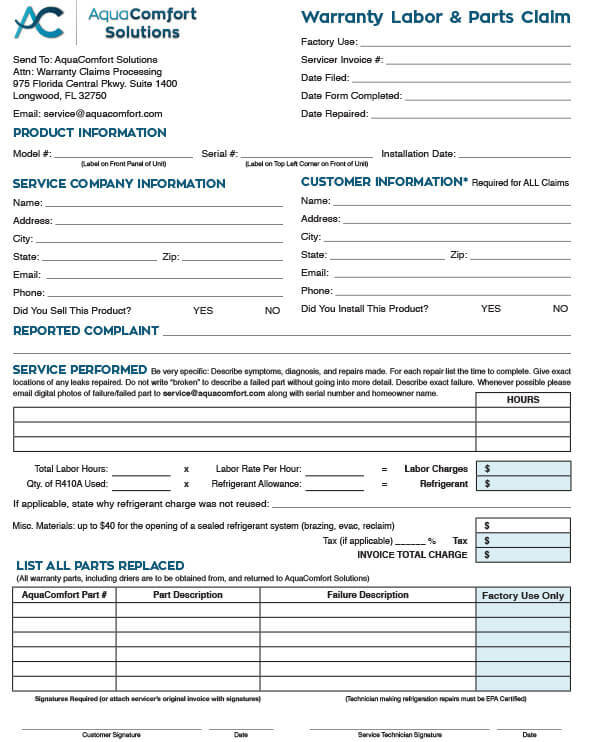 If service is ever needed, simply fill out our Service Request Form and our representatives will reach out to you within 72 hours. You can also easily access owner’s manuals and AquaComfort FAQs on our website. AquaComfort pumps are available at authorized pool dealers across the U.S. Installation is made easy and painless, without any disruption to the surrounding landscape thanks to AquaComfort’s pool heater design. We can help connect you to the nearest dealer and get you started on your journey to longer summers.